Ivy Vines, a Kelly green creme, is part of the Colored Cremes Collection designed to partner with our Essentials Collection. 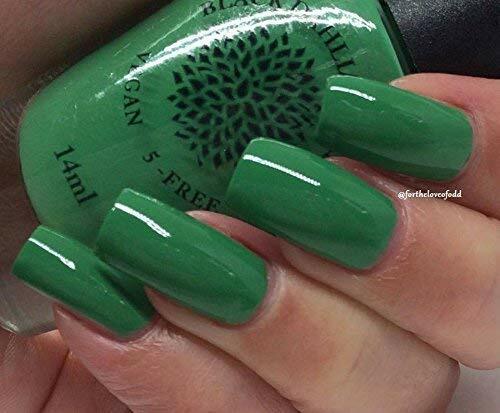 It is opaque in one coat, and works well for nail art or nail stamping. This polish is 14 ml, our full size. Black Dahlia Lacquer's polishes are hand mixed in small batches so slight variations are possible. We use only vegan, cruelty-free products. Our polish is also 5-free, which means it does not contain DBP, Toluene, Formaldehyde, Formaldehyde Resin or Camphor. Our polishes include flat brushes and one large stainless steel mixing ball. We recommend a gentle roll before use to redistribute the polish. Color: Ivy Vines, a Kelly green creme, is part of the Colored Cremes Collection designed to partner with our Essentials Collection. If you have any questions about this product by Black Dahlia Lacquer LLC, contact us by completing and submitting the form below. If you are looking for a specif part number, please include it with your message.